Placenta Cream for Mother is an amazing addition to your Placenta Capsules, as are many of the other placenta remedies and lotions Placenta Practice can make from your placenta. Placenta Cream for Mother is the perfect cream to reach for when your skin is feeling tired and is in need of a healthy glow. Placenta Cream for Mother is a light moisturising cream for all skin types. Its benefits are particularly noticeable on the face and neck, helping to smooth, plump and soften the skin. The cream is infused with your very own placenta tincture along with Neals Yard Essential Rose Oil. This means the cream has the nurturing qualities of the placenta, along with the floral tones of the essential rose oil. Combining these two elements creates a truly unique cream. This cream is perfect for new mummies to reach to during those emotional and tense times. The placenta is rich in stem cells, amino acids, minerals, vitamins, growth factors, oestrogen, estrogen and progesterone. As the creams are made from a small piece of your placenta, you benefit directly from all the goodness it has to offer. The amazing properties in your placenta will help tone and rejuvenate the skin, stimulate blood circulation and increase the collagen. Did you know that placenta creams have been used by the rich and famous for many years to combat signs of aging? So why not add a Placenta Cream for Mother to your Placenta Encapsulation order. Your placenta cream has amazing healing properties too, many of our clients regularly report improvement in skin conditions such as psoriosis, flakey skin, and acne. Our Placenta Cream is light and has moisturising properties. They are handmade and contain no nasty ingredients, only natural ingredients are used to make up this beautiful rose smelling cream. We can also make a Placenta Cream for Baby which is much more gentle on babies skin and may help heal a myriad of skin complaints such as itching, eczema and other skin irritations. 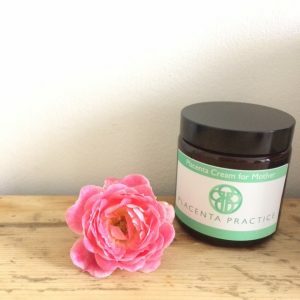 The placenta is amazing, and so are the creams made from it! Placenta Practice is the leading company in the UK to offer Placenta Encapsulation Services. We work to the highest standards in our field and have many ‘UK firsts’ in placenta encapsulation. Placenta Practice was the first company in the UK to be inspected, approved and certified by Environmental Health and Public Health UK. We are documented to exceed all health and safety requirements. Our mission is to lead the way and set standards in the placenta encapsulation industry. Placenta Practice is acknowledged to go beyond all accepted government standards. Our custom built practice, with hospital grade equipment and surgical grade supplies have all been judged to be the “Gold Standard”, a “benchmark others should aim for”. We designed a bespoke Placenta Collection Kit – another first in the UK – for you to store your placenta until collection. This kit has been designed by a leading bio-medical scientist specialising in medical transport with input from Environmental Health Office UK. The kit ensures your placenta is kept safe and below critical temperatures during storage, collection and transportation to our practice. It is also hoped the use of the kit will drastically reduce the unfortunate instances of lost placenta in hospital wards.